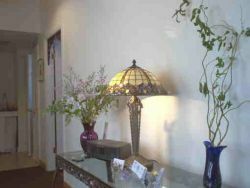 Still Waters Massage Therapy offers a wide variety of modalities provided by a team of two highly skilled and motivated therapists, whose common goal is the healing and health maintainance of our diverse community. As always, we work closely with other holistic health care resources as needed to help make our goal of optimum health a reality. New clients are always welcome as we continue to serve and value those we have worked with for over 25 years. We welcome opportunities to help eradicate diseases and conditions that ravage our lives, such as cancer, mesothelioma, multiple sclerosis, ALS and many more through awareness and education. Susan Dexter is a graduate of the Natural Therapy School of Massage in Taunton, MA. Upon graduation in 1987, Susan founded Still Waters Massage Therapy. Since then, she has seen her business grow tremendously as the level of public awareness and education as to the benefits of skilled bodywork has increased. Susan treats each and every client with respect and a willingness to help promote health and wellness. Continuing education is important to Susan, and she has taken advantage of many opportunities to add new skills and knowledge to her practice. The modality which Susan believes to be one of the most effective available is CranioSacral Therapy, and she continues to receive training from the Upledger Institute in that therapy. With each level of training completed, Susan has seen the effectiveness of her sessions increase. In addition, Susan is a graduate of the Equissage program, which enables her to effectively administer therapeutic sports massage to horses. Because of her love for animals, she is grateful for every opportunity to help them. Susan is a Professional member of Associated Bodywork and Massage Professionals. Call Susan at 508-525-1267 to schedule your appointment. Leanne LeBlanc has been a valuable, respected member of the massage community for over 15 years. With a dedicated following of long-time clients, she welcomes new opportunities for healing and wellness, and is available by appointment at Still Waters most days and some evenings. Call 508-525-1267 for her contact information.